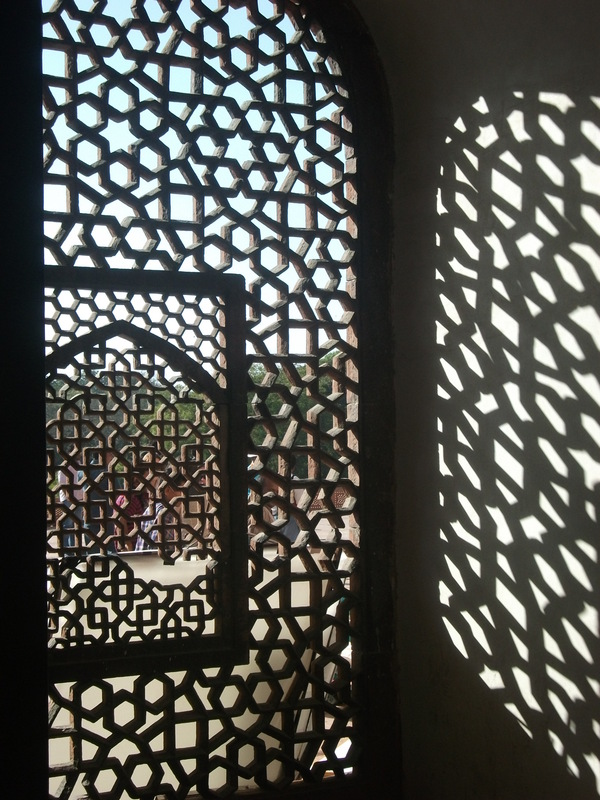 A four-hour evening train from Jaipur brought me to Agra, home of the Taj Mahal. 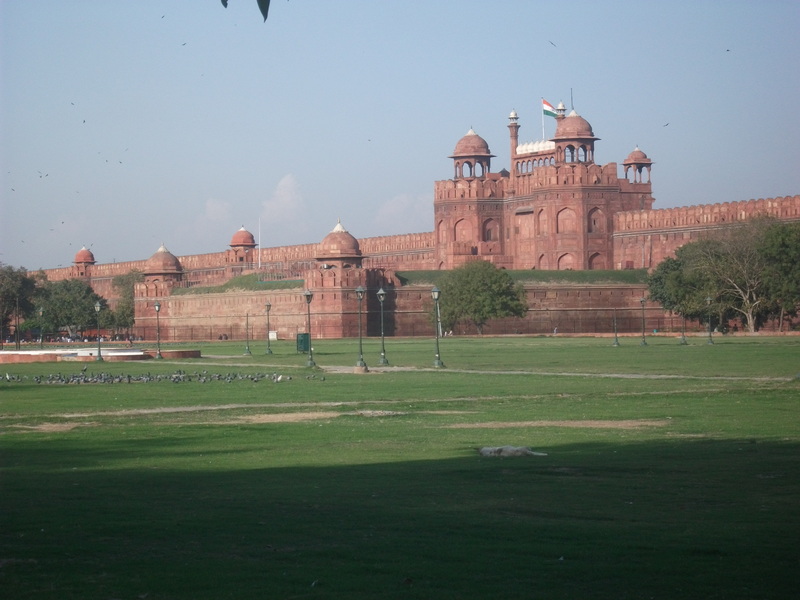 But on my first day there I decided to see the Fort, mostly because everyone recommends getting to the Taj early and I was feeling lazy, but also because I thought I should work up to the main event. 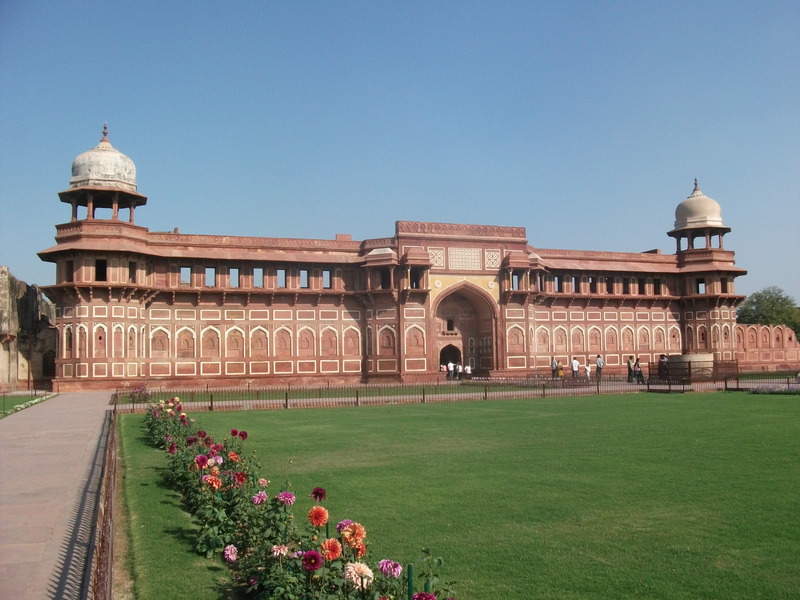 Agra Fort is a large sixteenth century fortified citadel containing a number of palaces and mosques. 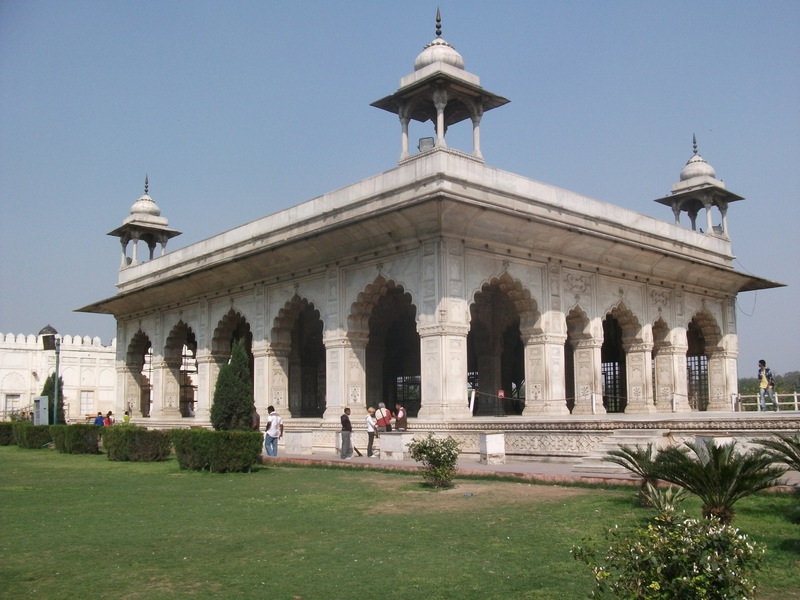 It was founded by the Moghul Emperor Akbar but brought to its present state by his grandson Shah Jahan, who did some demolishing and adding of buildings. 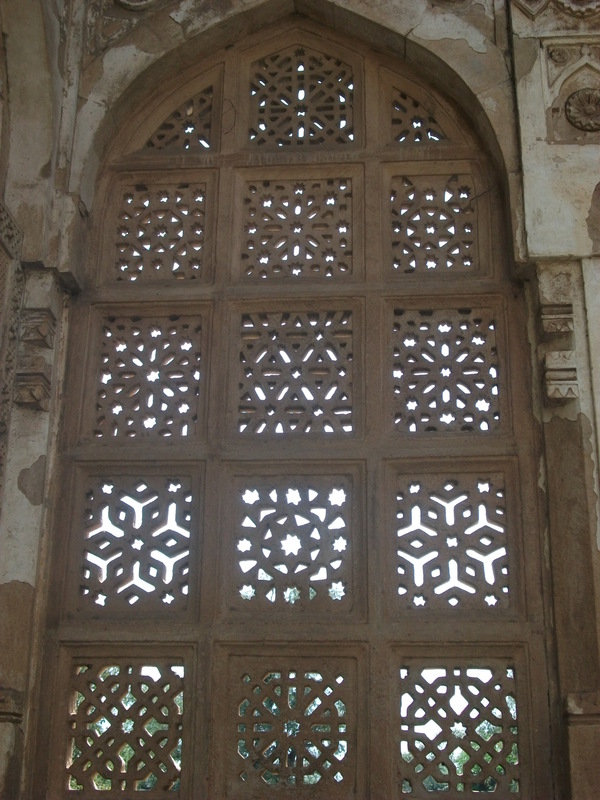 Shah Jahan was imprisoned here later in life by his son Aurangzeb (a successful ruler but a religiously intolerant man who I have definitely taken against). 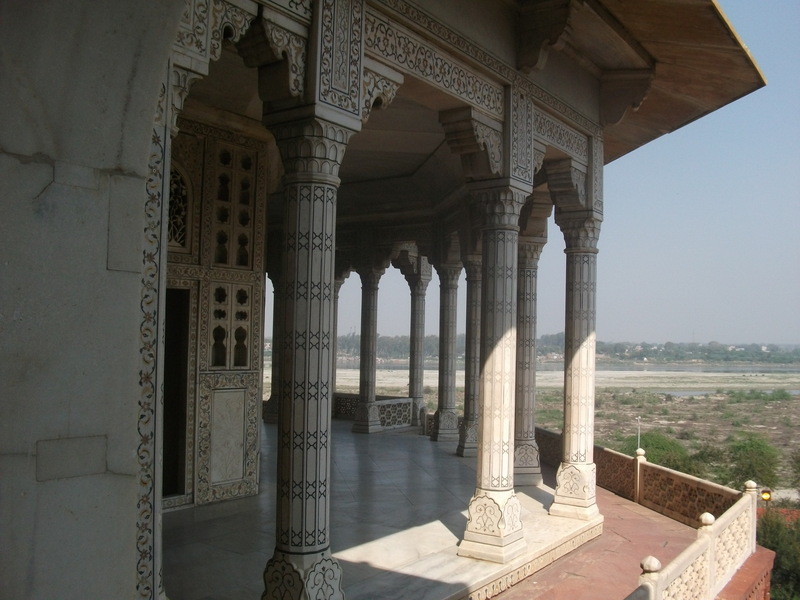 The former is said to have died in a beautiful balconied tower with a view down the river to the Taj Mahal, his wife’s mausoleum. 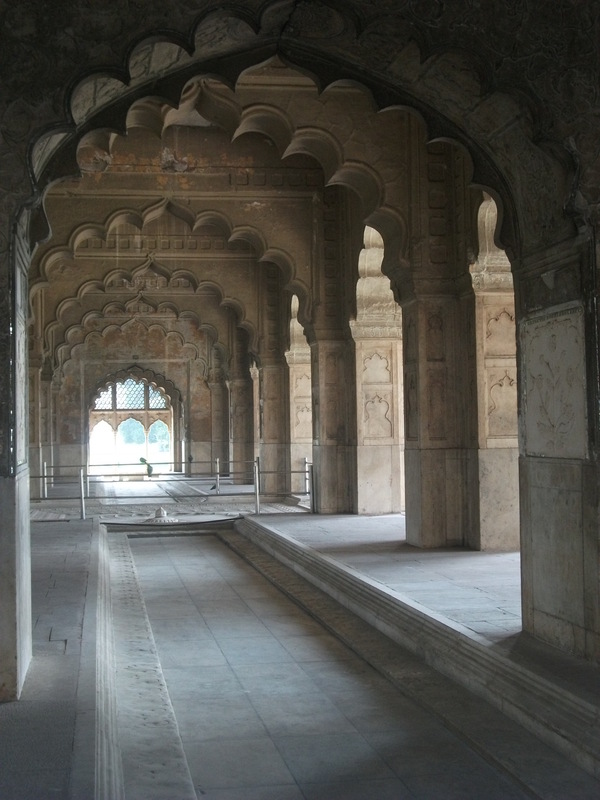 The UNESCO listing for the fort describes the palaces as “fairy-like”, which is perhaps overstating things (or maybe I have a different view of fairies), but there is some very attractive architectural detail and Shah Jahan’s contributions are lovely, featuring carved and inlaid white marble. 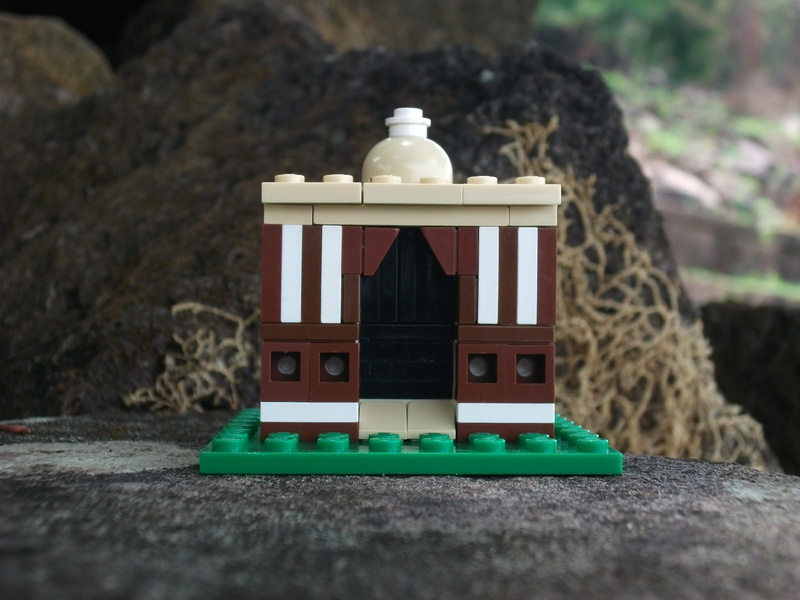 There are also two rather delightful gold-roofed pavilions which I was much taken with, but am sadly not equipped to replicate in Lego. I took the model out on a sunny day in Seoul but completely forgot to photograph it. So I ended up crouching in a doorway in the driving rain the next day trying (and failing) to get an in-focus shot. 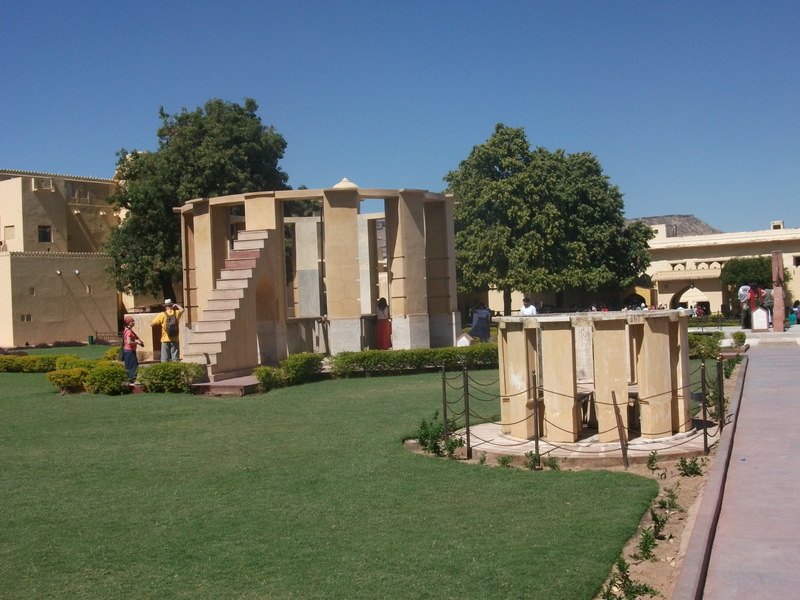 Jaipur is only four and a half hours by train from Delhi (a mere nothing for India) so I spent the day sightseeing before taking the evening train. 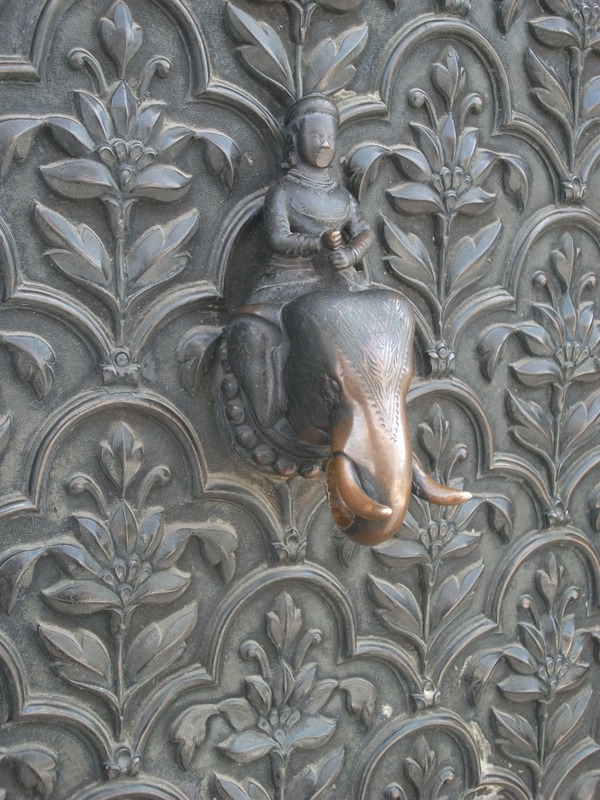 Jaipur has some other wonderful sights, but only this one is UNESCO listed. 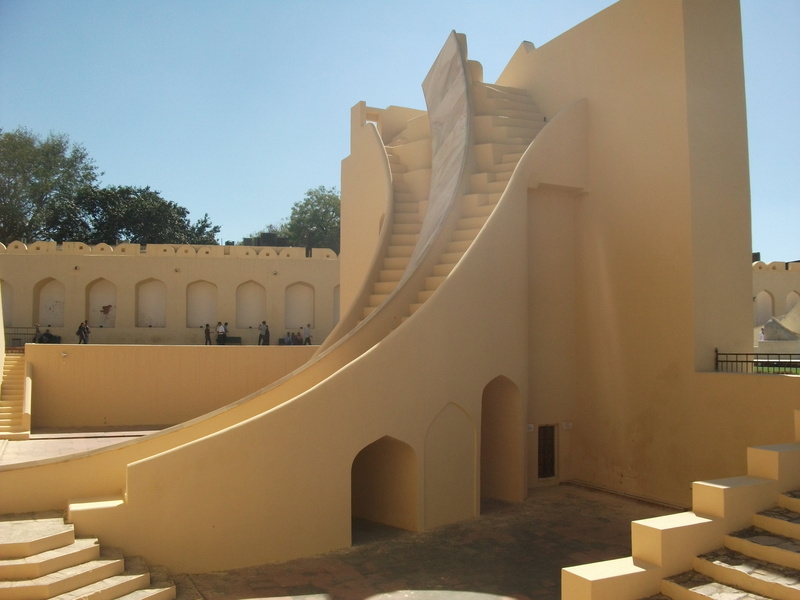 The Jantar Mantar is a group of around twenty monumental scientific instruments for naked-eye astronomical observation and measurement, dating from the early eighteenth century. 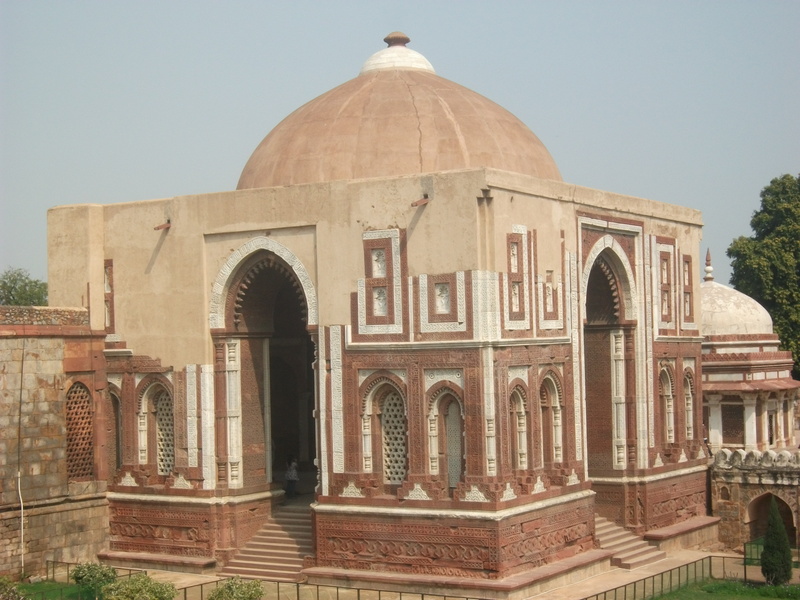 It is the largest and best preserved of five such observatories built by Maharaja Jai Singh II, a Hindu ruler with a great interest in architecture and mathematics. 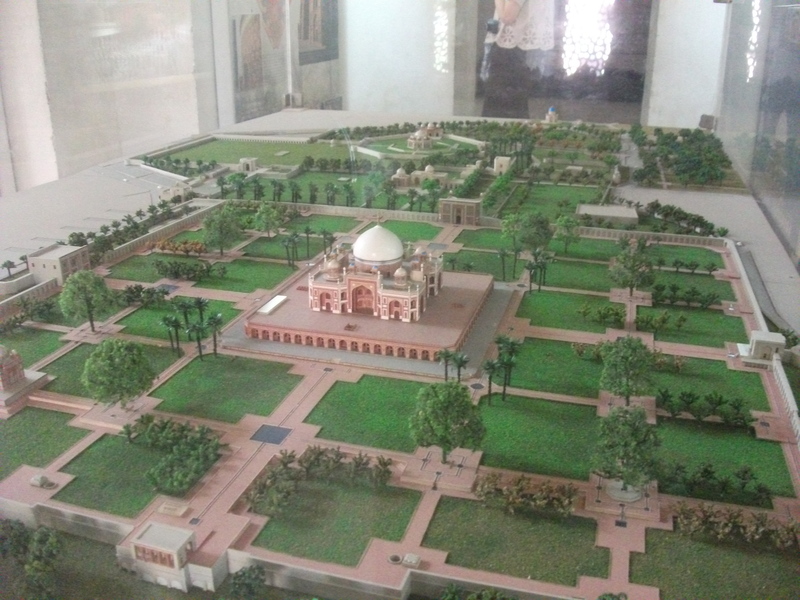 I have wanted to visit one of these sites ever since I saw a model of one on display in the Science Museum in London, where I worked for many years. It turned out to be even more impressive in the flesh (brick) than I’d expected, being both fascinating and sculpturally beautiful. 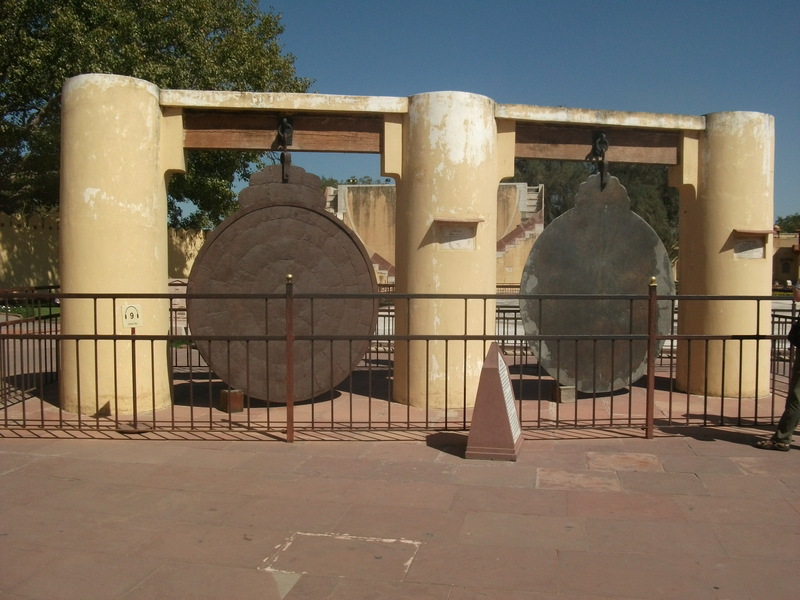 The bulk of the instruments are for measuring the position of the sun or other celestial bodies in the sky, and many of then look like sun dials, with a semicircular scale and angled gnomon. 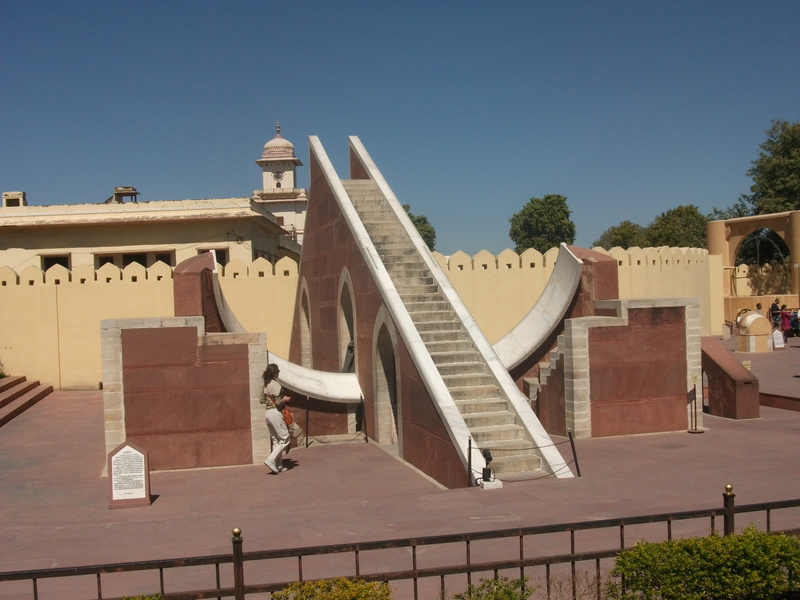 Others however, including some that were devised by the Maharaja or his astronomers, are visually harder to grasp. In particular those that come in pairs: they have cut-out access routes in the gridded surfaces on which measurements are taken, with the other half of the pair having the cut-outs and measurement surfaces transposed, so between them, there is one entire surface. 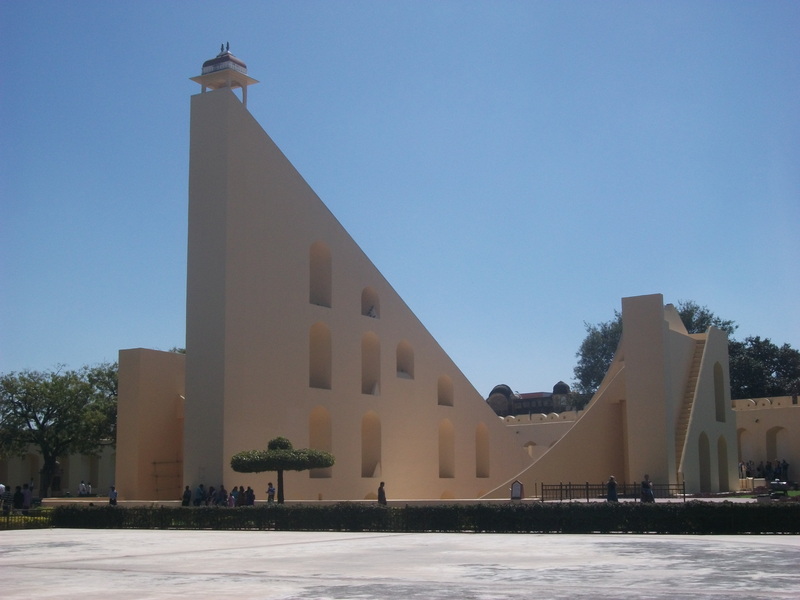 The most spectacular instrument is the 27m high giant sundial (the Samrat Yantra) . Some argue that the larger the instrument, the more accurate the reading as you can have more scale divisions. But I’ve also read other sources that disagree on the basis that the edge of the gnomon’s shadow is just too fuzzy to take advantage of finer gradations. 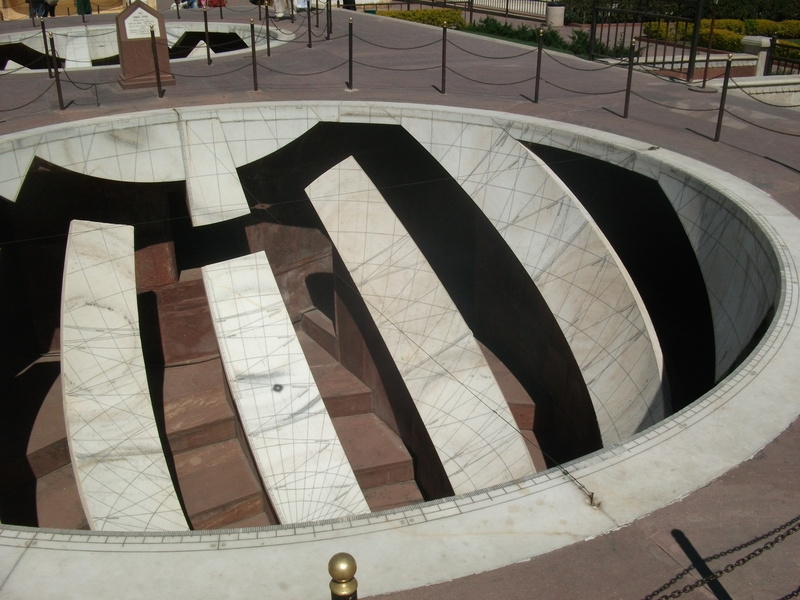 My favourite were probably the group of twelve much smaller sundials all built at different angles, one for use in each month of the year and each labelled for a different sign of the zodiac. En mass I think they look wonderful! 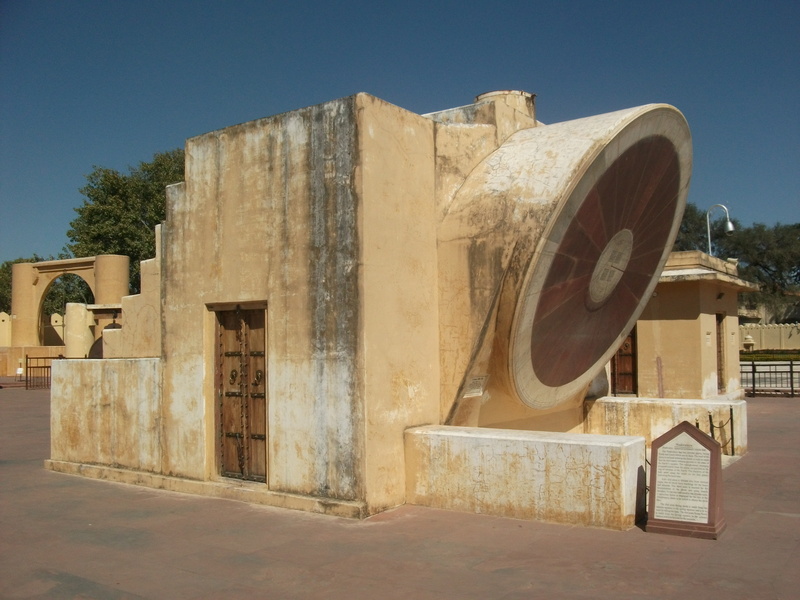 The instruments were used for time measurement, tabulating star positions, predicting eclipses and weather forecasting – the arrival of the monsoon for instance. The site has a great audio guide which does its best to explain how all the instruments were used, but I really needed diagrams to fully grasp it. You can find out more in this article. 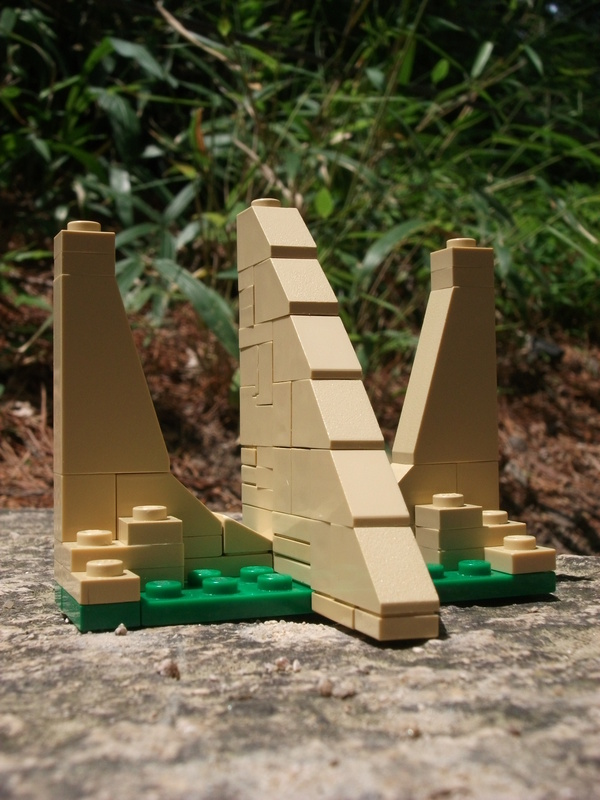 For the Lego model I’ve built one of the sundial structures. I know the approximated curve I’ve built is not correct (it should be a segment of a circle) nor in the right orientation (the angle of the gnomon should be at right angles to the plane of the curve), but hey, it’s only Lego and the best I could do in the circumstances. 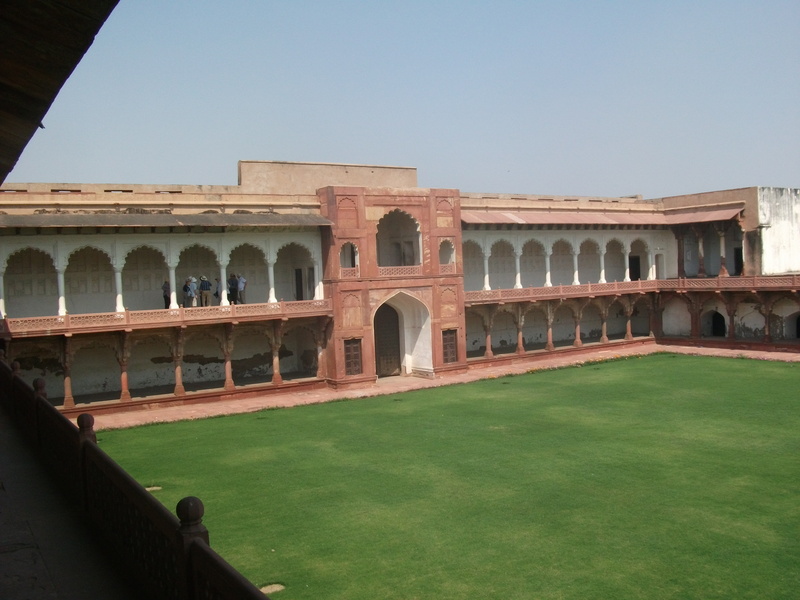 This fortified palace was built in the seventeenth century by the Mughal emperor Shah Jahan, he of Taj Mahal fame (we’ll be coming on to that in a few posts time) when he moved his capital here to Delhi from Agra. 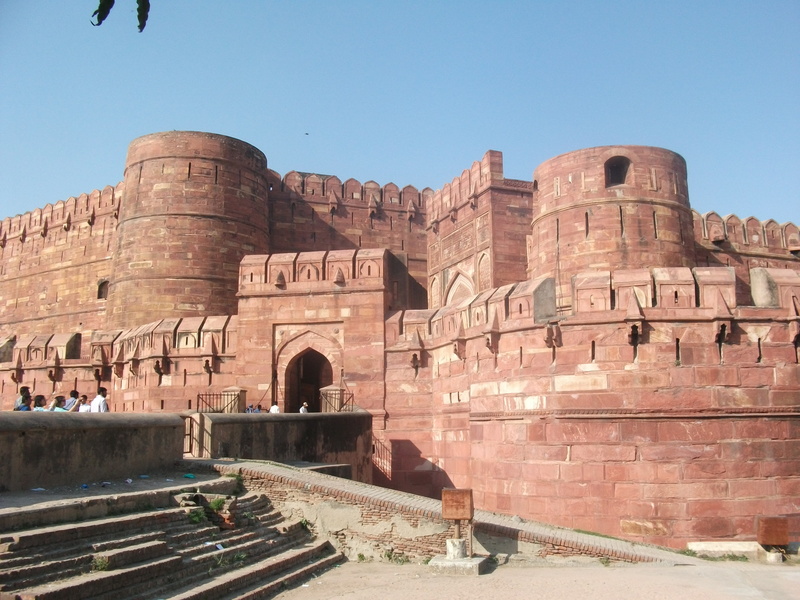 The name derives from the two and a half kilometres of red sandstone defensive walls, that were once surrounded by a moat, fed by the adjacent Yamuna river. 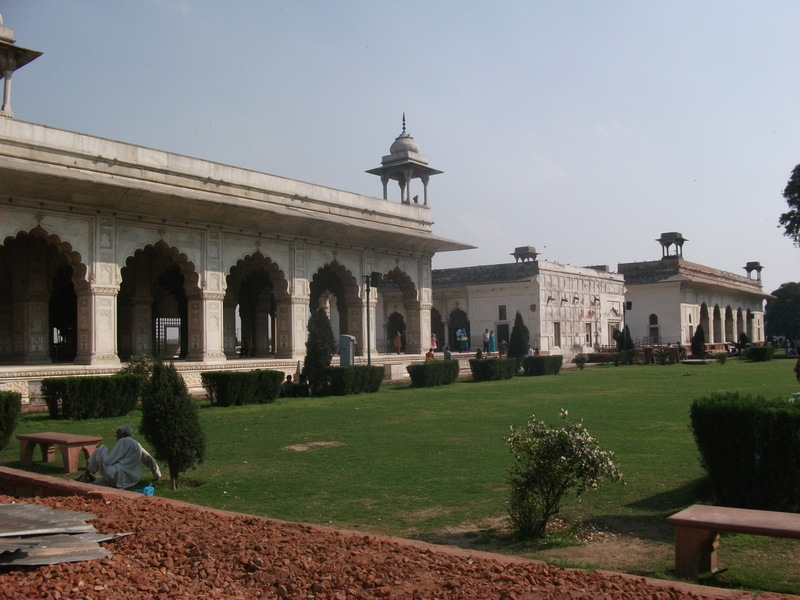 Once inside the main gate you find yourself in a covered bazaar (now full of souvenir shops) where items the royal household might like to buy, such as silk and jewellery, were sold. Which I suppose is rather like having a branch of Harrods just inside Buckingham Palace. 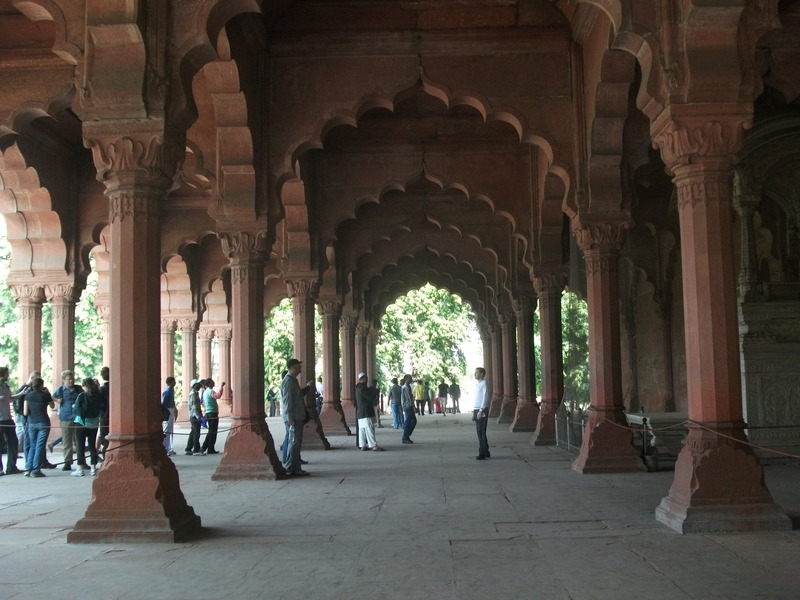 Having shaken off the hawkers you get to a large gateway building, in the upper level of which musicians would once play, and this in turn leads to the impressive public audience hall, the Diwan-i-Aam, reached through a garden. 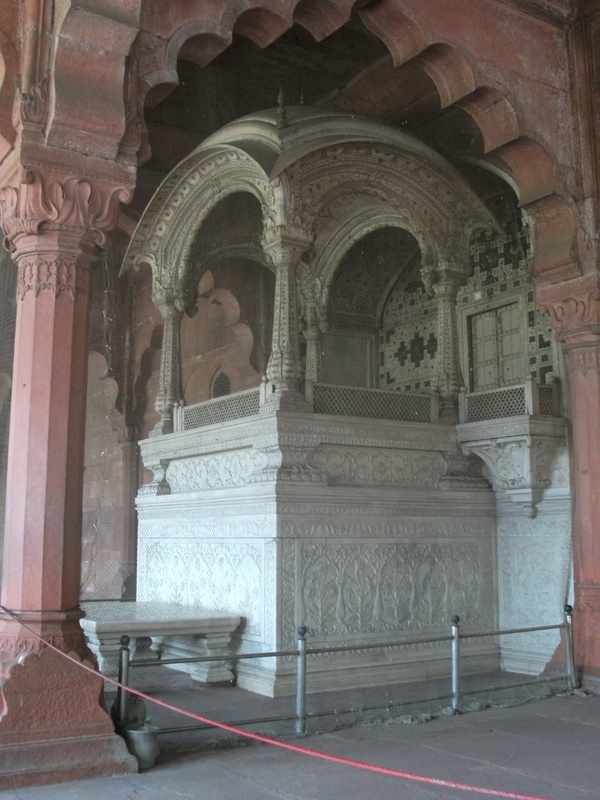 The hall has a raised marble throne that is shrouded in anti-pigeon netting which, along with the endless procession of people having their photograph taken in front of it (I still fail to understand this almost universal urge), make it hard to appreciate the fine carving and inlay work. 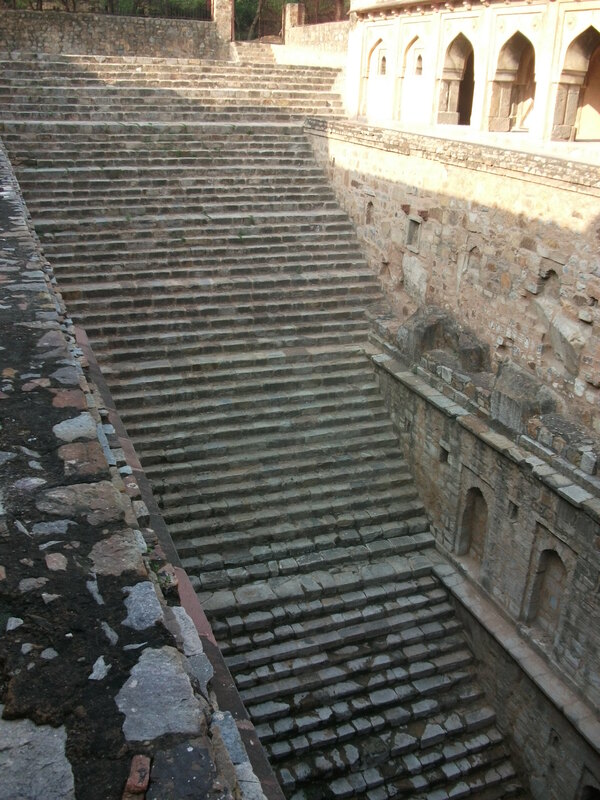 Behind the public audience hall are the private apartments, a line of pavilions on a raised platform looking out over the river (or at least, where the river used to be) and connected together by a marble water channel known as the “Stream of Paradise”. 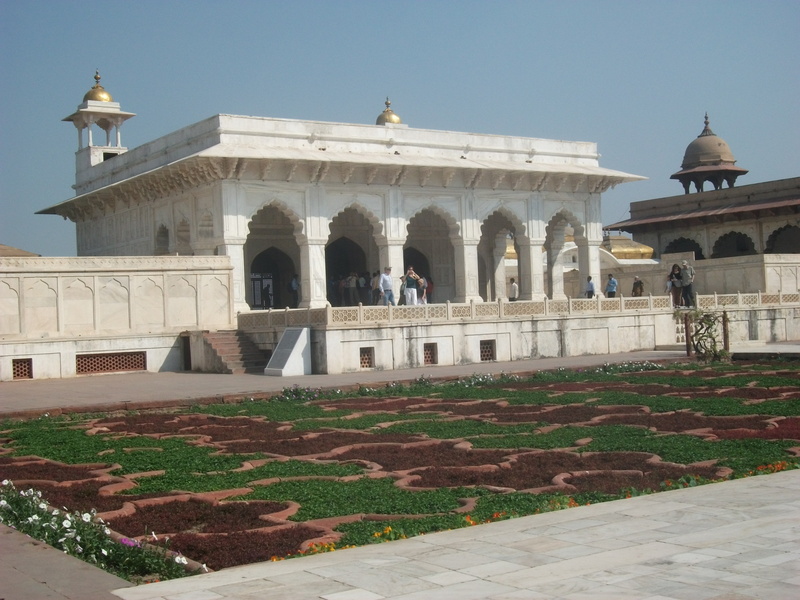 Continuing the metaphysical theme, the palace is blessed with extensive gardens, filled with water features and pavilions, the whole intended to evoke the Quran’s description of Paradise. 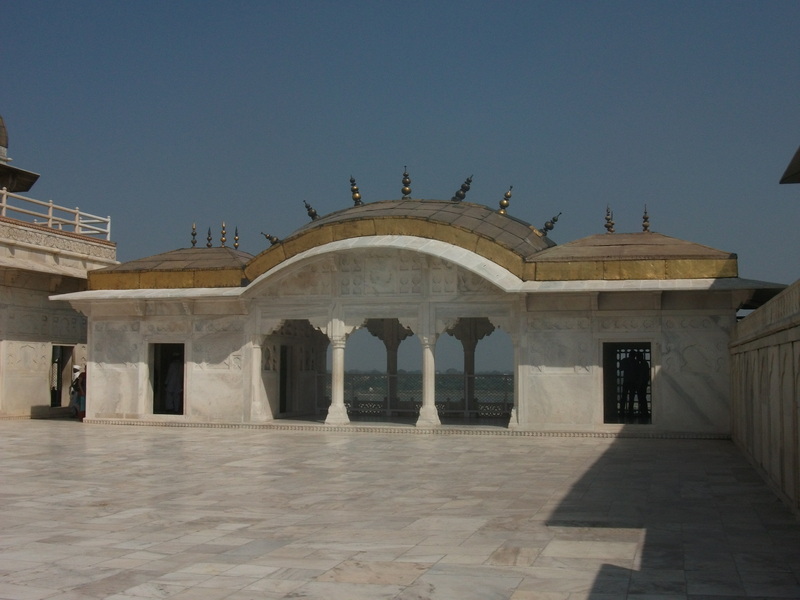 Indeed there is an inscription of a verse of thirteenth century Sufi poetry on one building that essentially says “If there is a paradise on earth, it is here”. 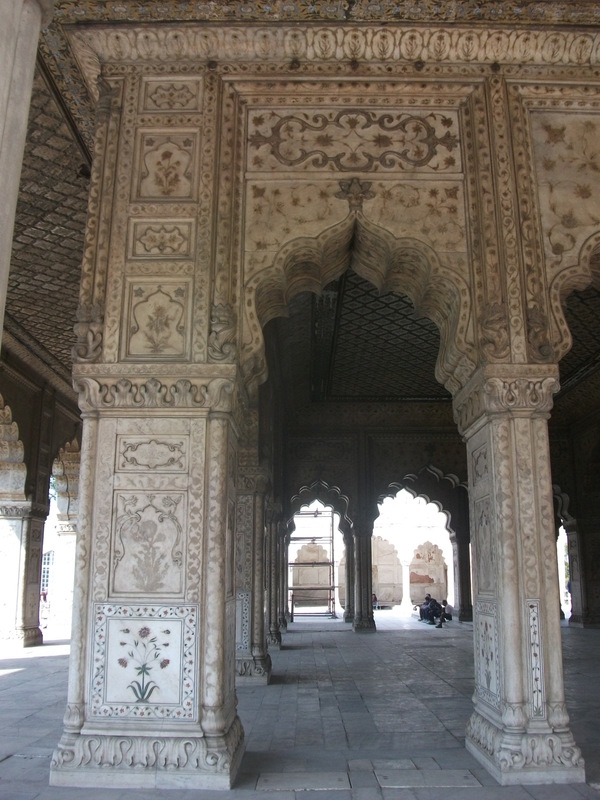 These buildings are in white marble with carved, gilded and inlaid decoration. 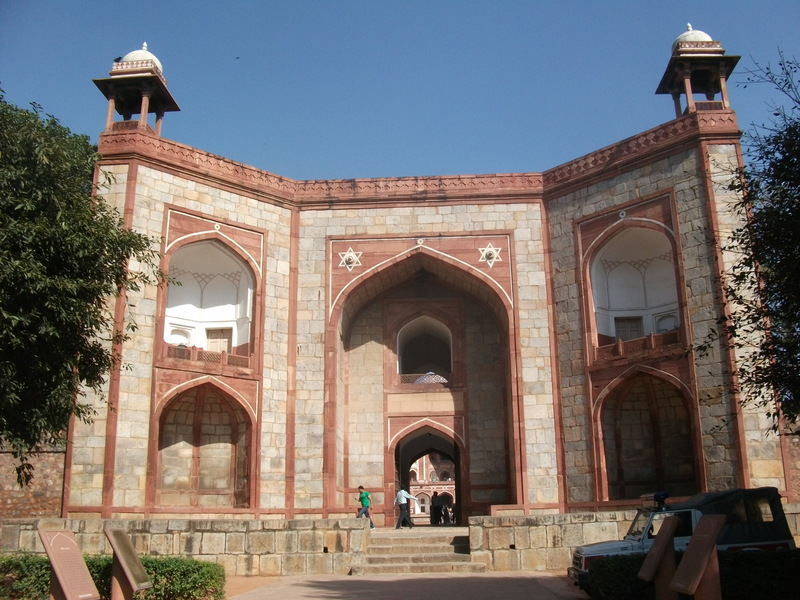 The palace is considered, according to the UNESCO listing, “to represent the zenith of Mughal creativity”. 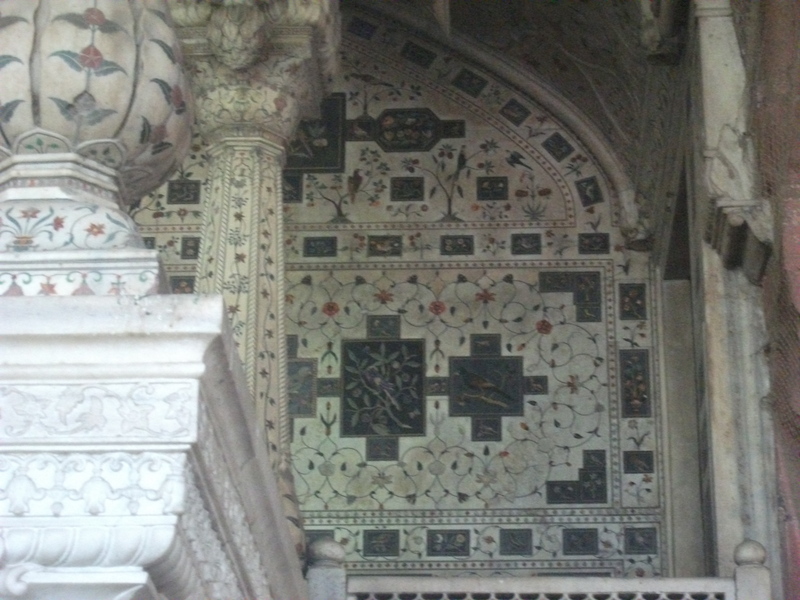 It really is gloriously ornate. 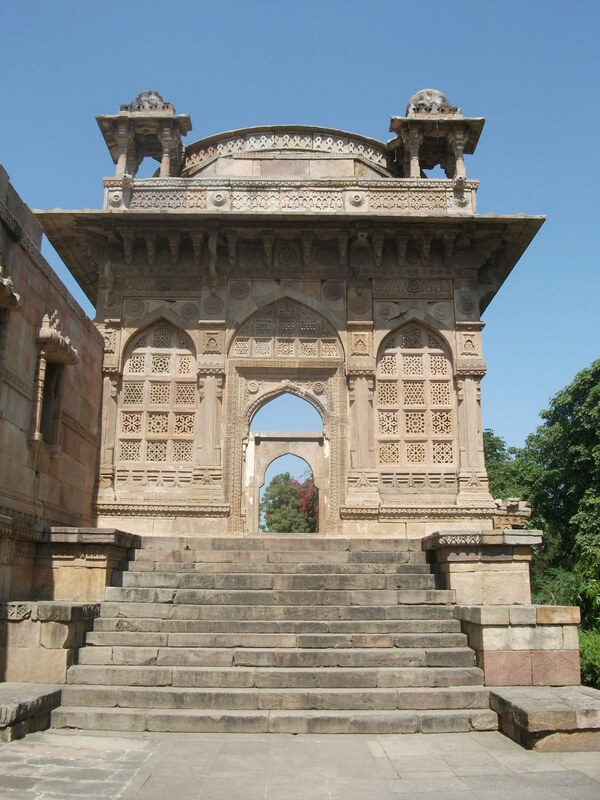 Unfortunately much of the wealth of the palace, that which had not already been plundered by the Persians (their haul included the emperor’s Peacock Throne, adorned with the Koh-i-Noor diamond) in the eighteenth century, was taken by the British who also added some uninspiring buildings of their own to the fort. 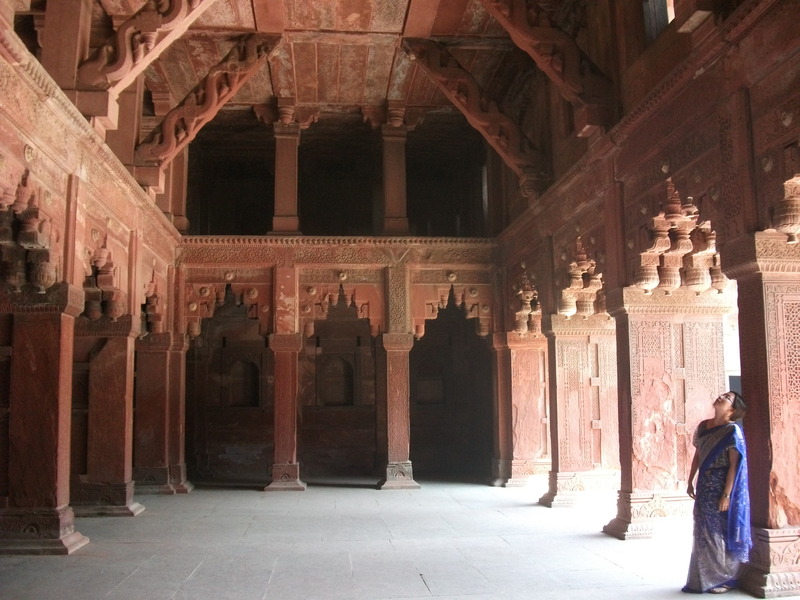 So while the palace looks marvellous, it is empty and gives only a hint of its former lavish glory. 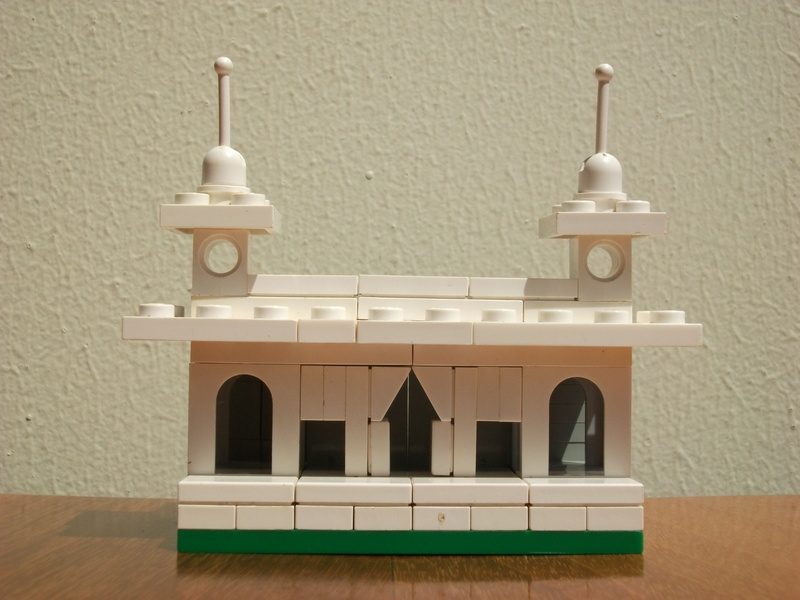 For the Lego model I chose the Diwan-i-Khas, the private audience hall. 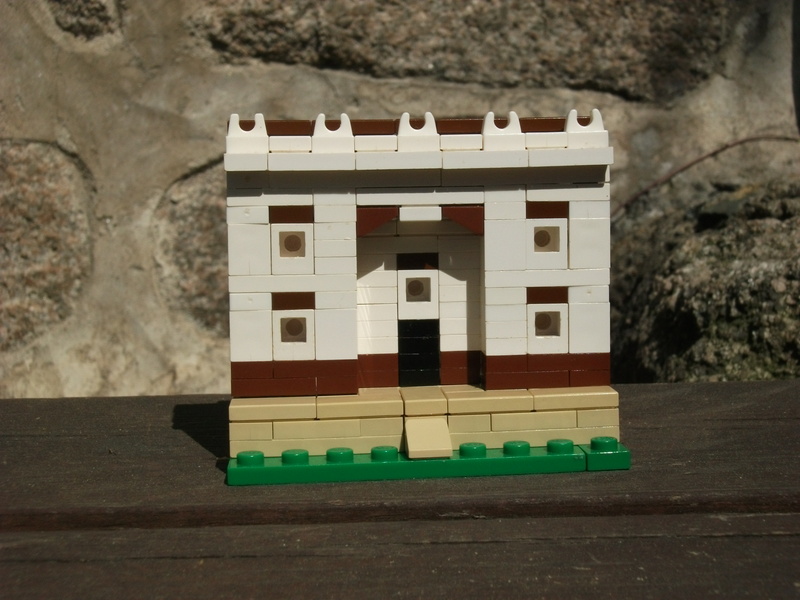 The view I’ve built is the narrower facade, on the right in this picture. 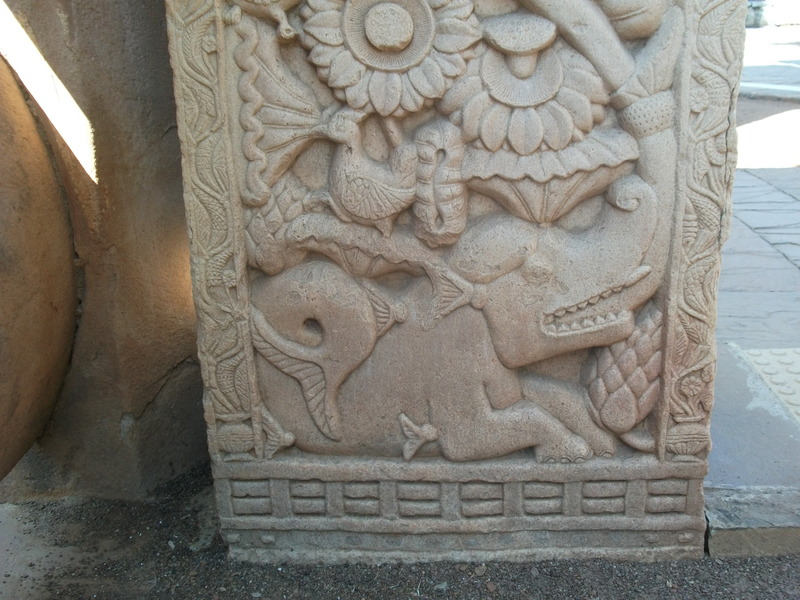 Allegorical symbols of Paradise not shown. 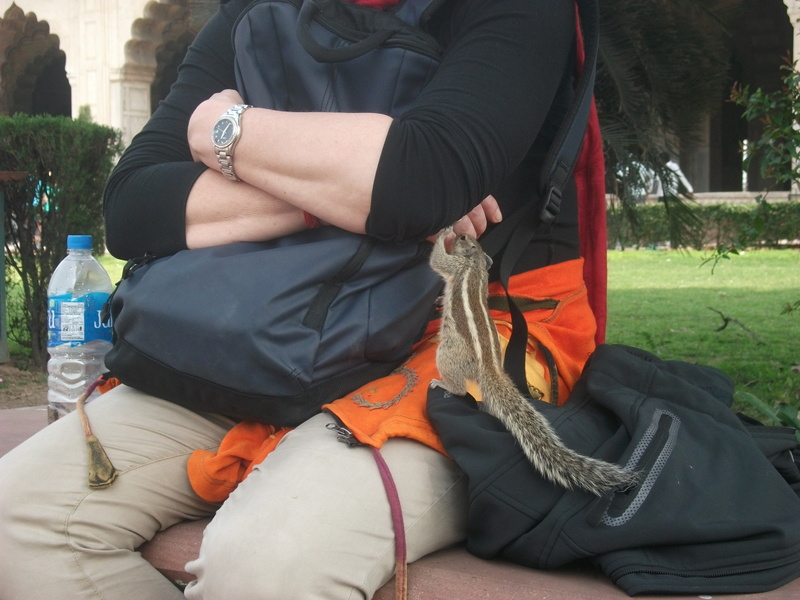 Here’s a bonus photograph of a squirrel eating almonds from the hand of a German lady I chatted to. She said she’d found these were their favourite. In a complete break with all my previous (and as it turned out, subsequent) train journeys in India, the one from Bhopal to Delhi included free food. The train left just before 3pm and arrived close to midnight, closer than advertised certainly. During that time they served us five meals (well, they weren’t all full meals, let’s call them dietary interventions) of various sizes and types. By the time I got to my rather nice hotel I was stuffed and had pockets full of packaged snacks that kept me going for days. That trip to the hotel involved joining the scrum queue at the pre-paid Police taxi booth in the station car park, finding a driver who was prepared to actually take the voucher without the promise of an extra substantial ‘tip’ and then scarpering with my backpack when we finally found the hotel, with the cry “more money” ringing in my ears. Delhi taxi drivers are rapacious. 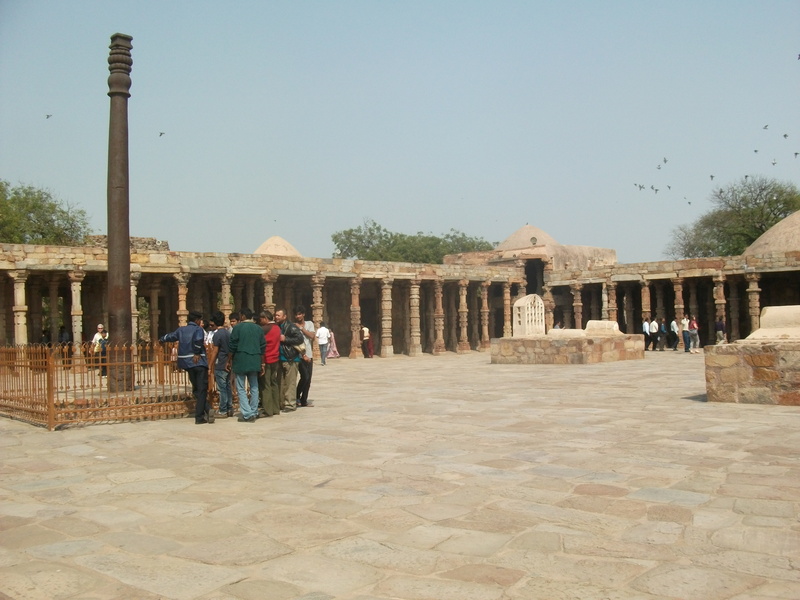 In addition to the general attraction of being Delhi, the city has three world heritage sites, my first visit being to this one, a few kilometers south of the centre via the terrific metro (where they frisk and bag scan everyone on entry – imagine that on the Tube!) and a slightly too long walk. 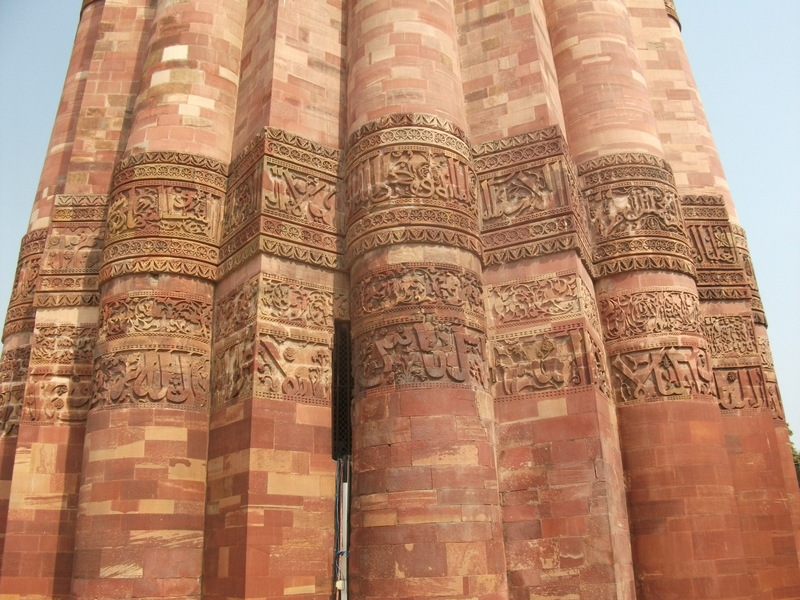 Qutb Minar is a 72m high red sandstone minaret from the early thirteenth century, with later alterations to the top, which also lost its crowning cupola in an earthquake. 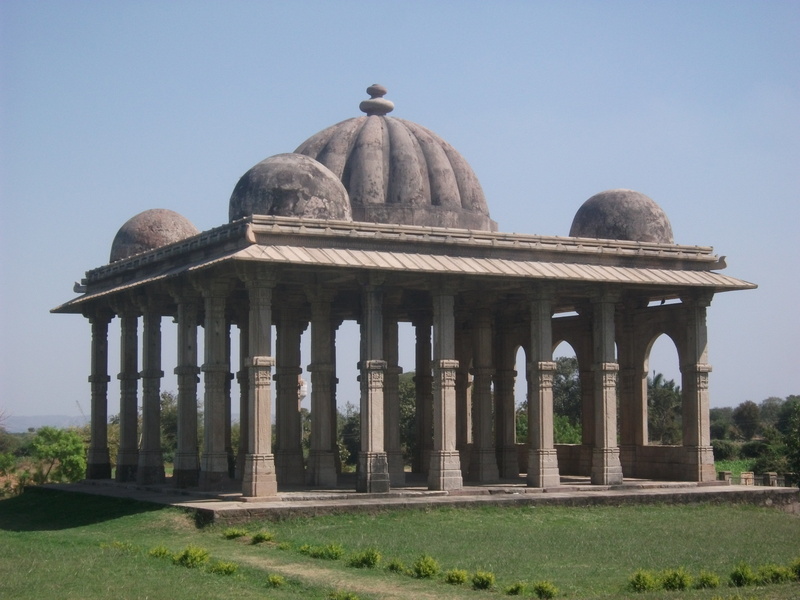 The surrounding monuments include the remains of two mosques, one built using stone pillars from demolished Hindu temples. 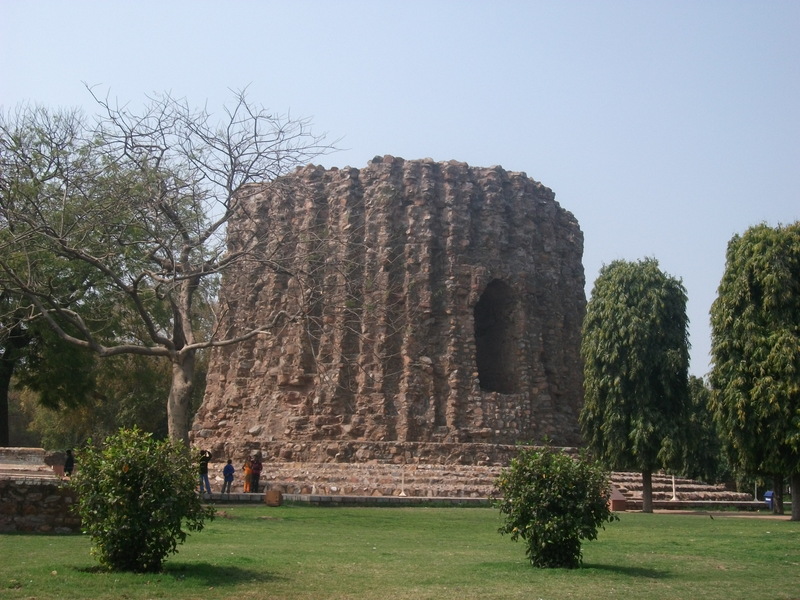 The site is further garnished with some ornate tombs, a 7m tall iron pillar renowned for its un-corroded state (due to serendipitous metallurgy and environment, not magic, religion or aliens) and the huge base of the unfinished Alai Minar, intended to be twice the height of Qutb. 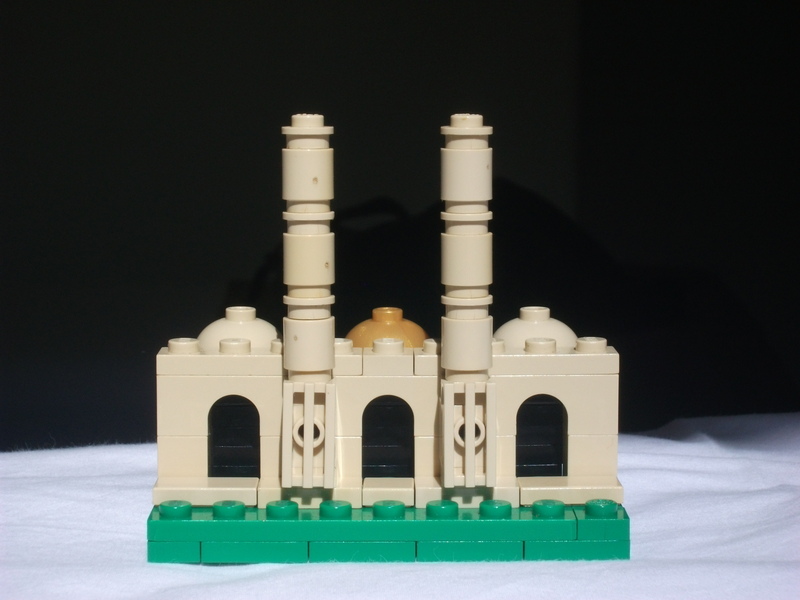 Finally, there is a marble-inlaid entrance gate called the Alai Darwaza, which I chose for my Lego model. My dome is a little too small, but otherwise, I felt this one turned out not too badly. 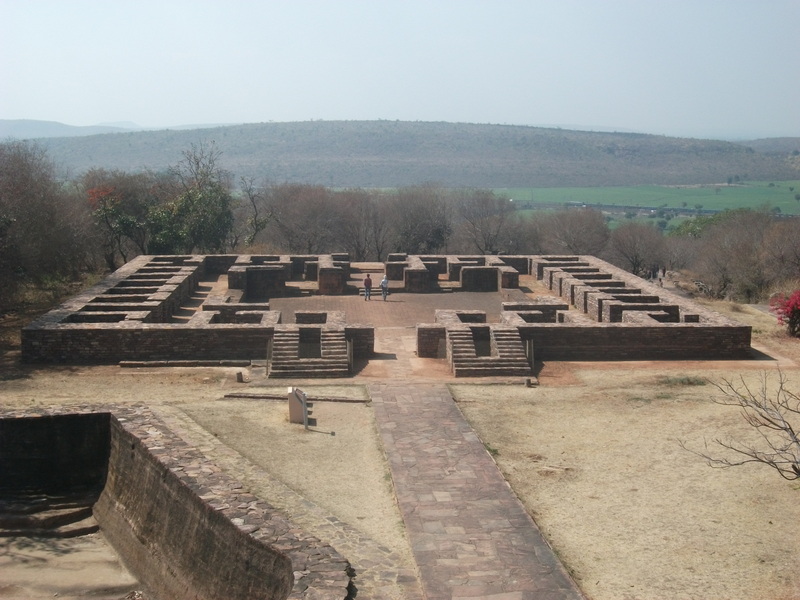 To the south is a scrubby wooded Archeological Park dotted with a large number of ruins from various periods. 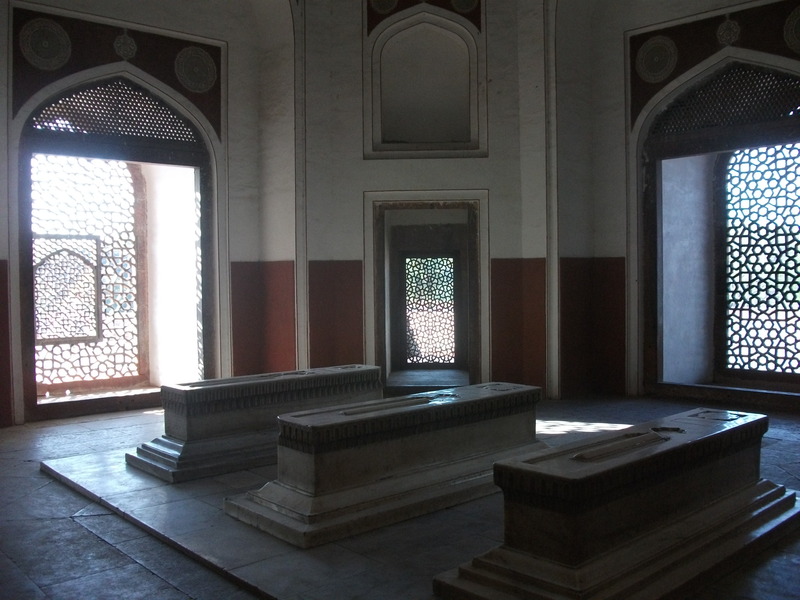 I explored them on the way back to a different (but equally inconveniently located) metro station. 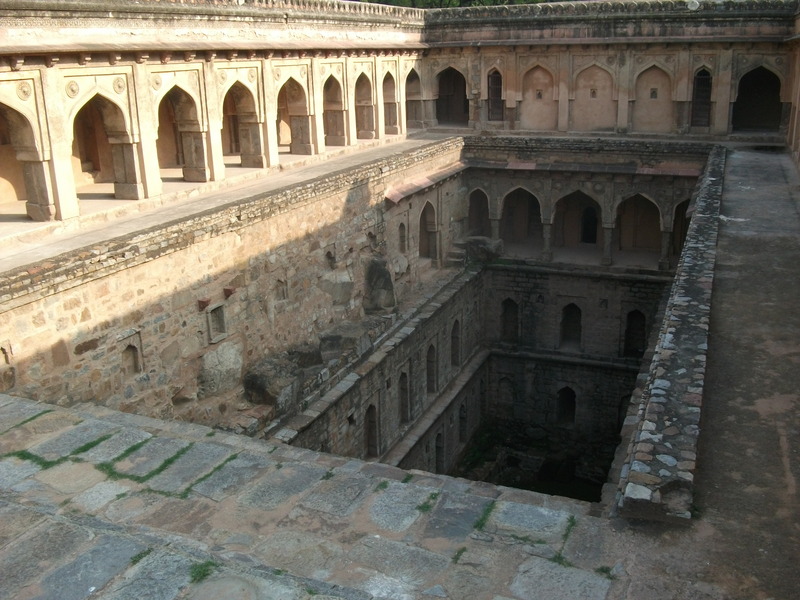 My favourite was this deep step well and surrounding building. 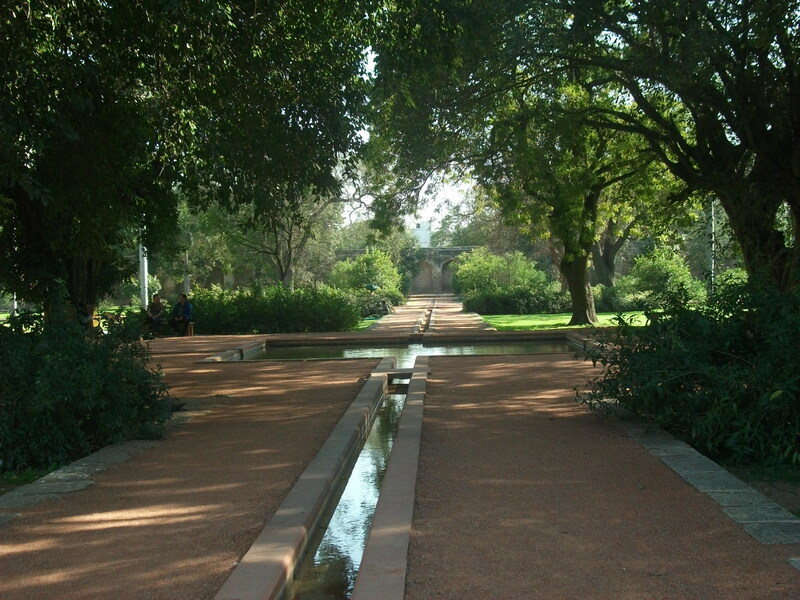 This photograph shows what is just over the lip in the foreground of the picture above. 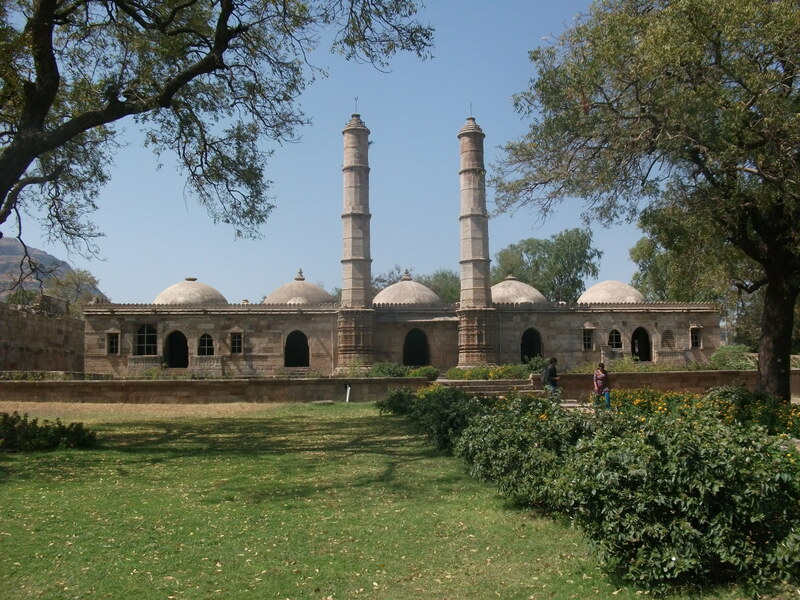 These monuments are a day trip out from the Bhopal, the infamous industrial accident city. I got there by overnight train, on a waitlisted ticket that turned into an actual ticket only a few hours before departure, which was exciting (my back-up plan involved a lot of buses). There is actually another World Heritage site in the area, called the Rock Shelters of Bhimbetka, which is a group of rock paintings from the Mesolithic period onwards. But I decided to give those a miss. 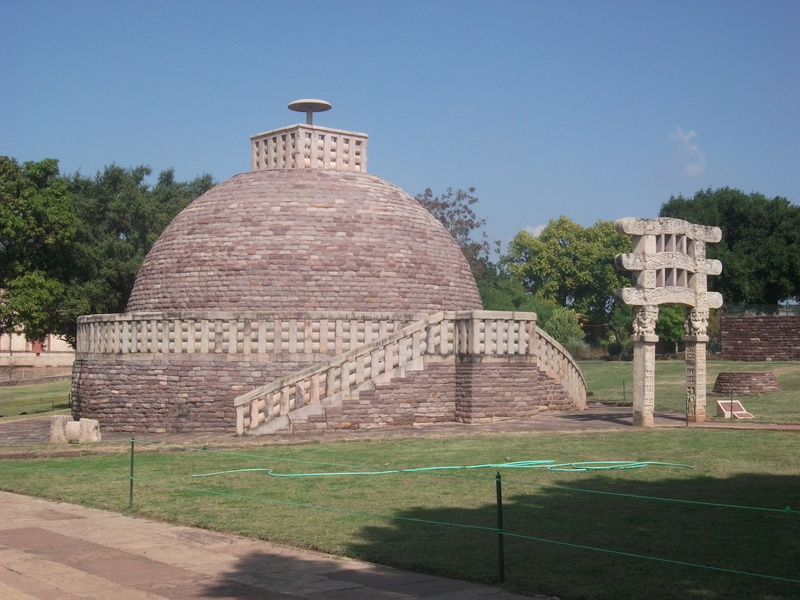 Sanchi is the oldest Buddhist sanctuary in existence, having been occupied from the 3rd century BC, and the Great Stupa dates from this period, although it was enlarged over the next two centuries. 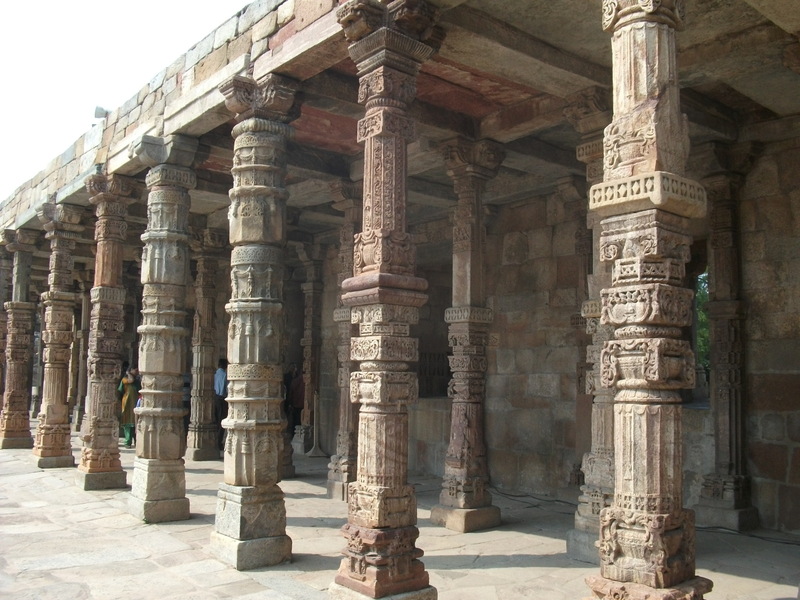 It is the oldest stone structure in India, according to a source cited on Wikipedia. 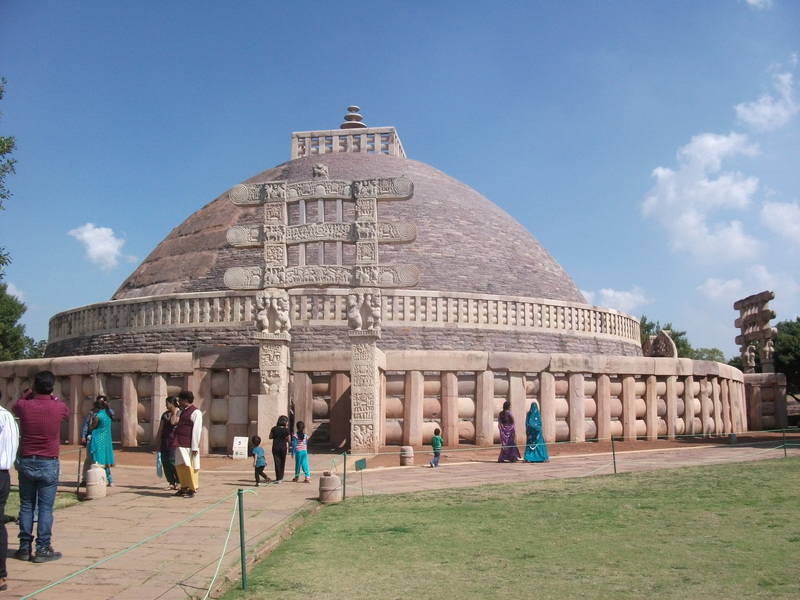 Later monuments were built up until the 12th century AD, when the site was abandoned. It was ‘rediscovered’ by the British in the early nineteenth century and restored to its current magnificent condition in the twentieth. 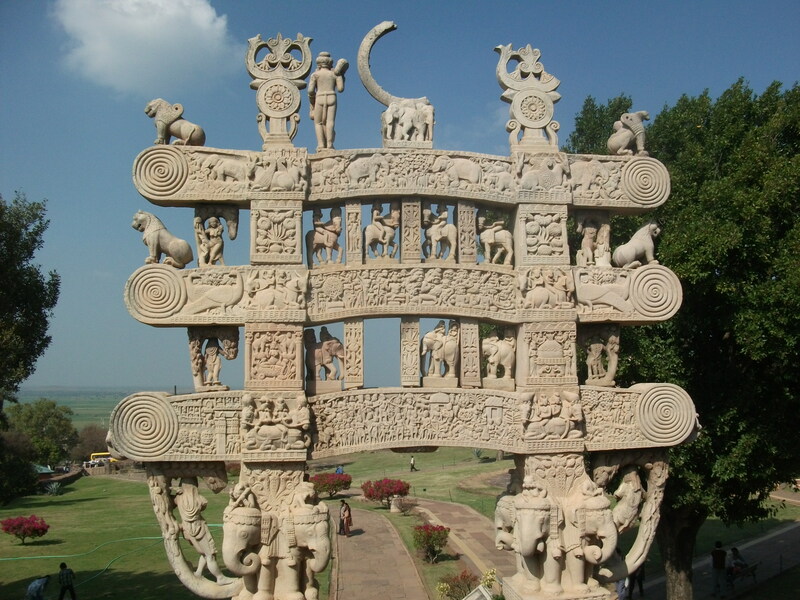 What makes this site particularly wonderful are the fabulous carved stone gateways; four around the Great Stupa and one by a smaller stupa. 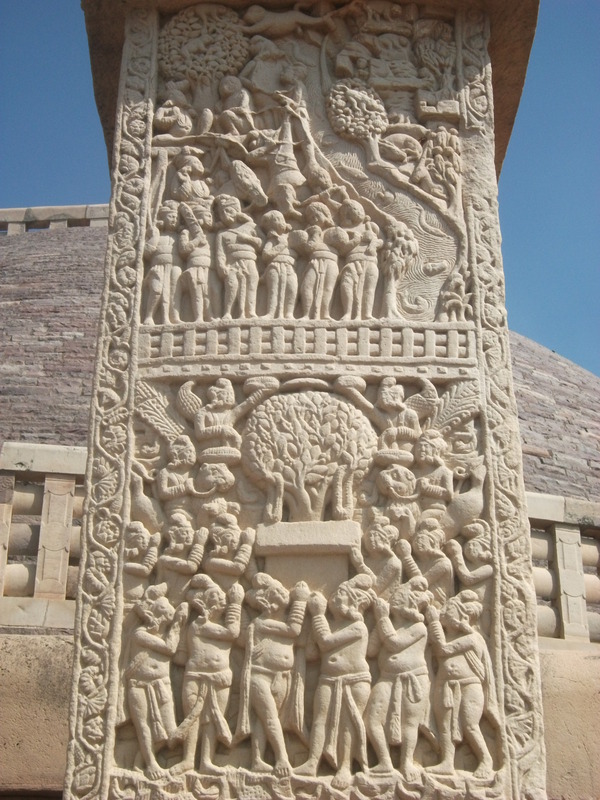 They are covered with scenes depicting the lives of the Buddha and other legends and despite being stone, replicate the structure of wooden ones. This was another site where tourists, particularly lone ones like me, were not in abundance, leading to rather a lot of requests to take my photograph from other visitors. 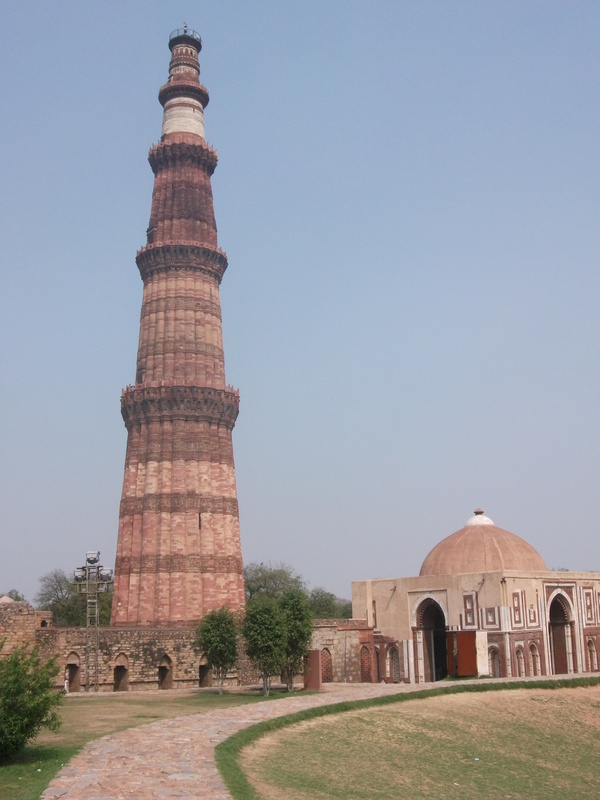 I still find it bewildering that for some people I seemed to be the most interesting thing there; I gazed at the monuments whilst trying to ignore them gazing at me. 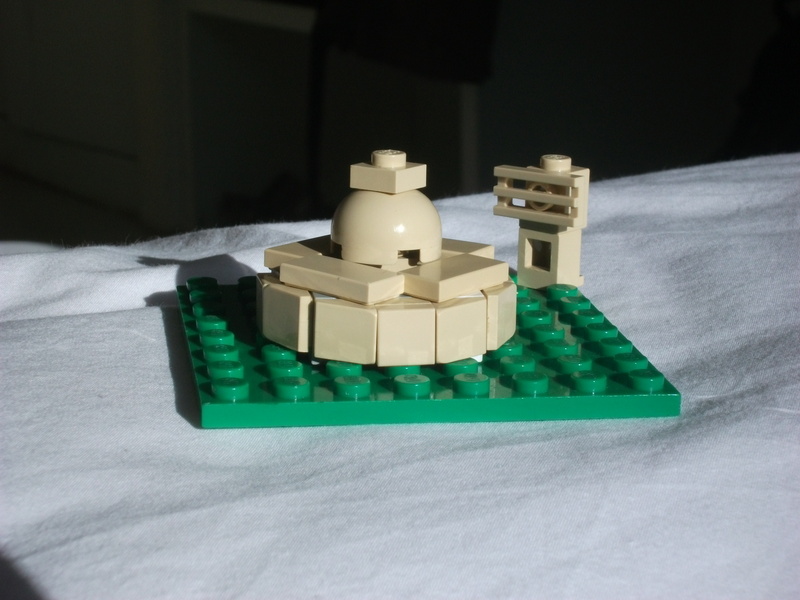 For the Lego model, I went with stupa number 3, the one with a single carved gateway. 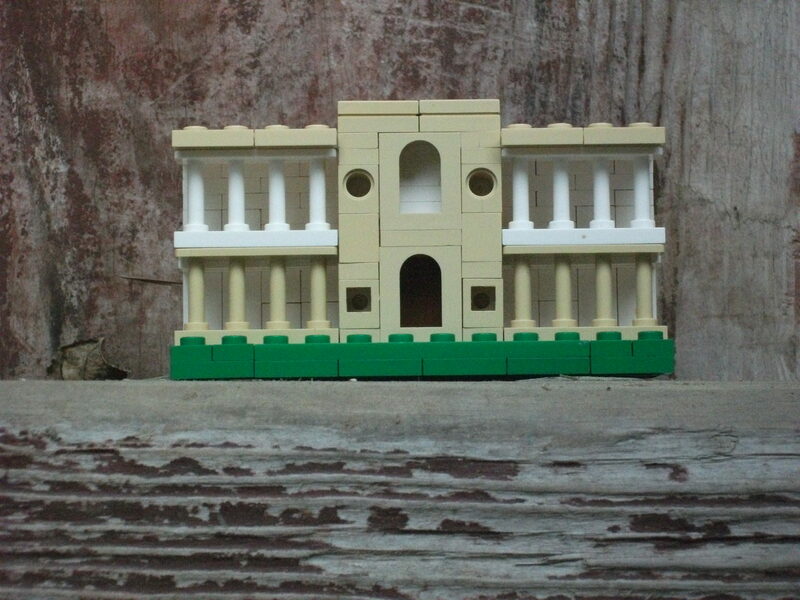 I’ve cunningly built it as viewed from behind, to avoid dealing with the curved steps on the other side. It’s not that impressive, sorry. Moving on from Aurangabad, I took a 6am train (suddenly a dubious hotel right by the station seemed an even better idea) back to Mumbai and then another north to the city of Vadodara, formerly Baroda. 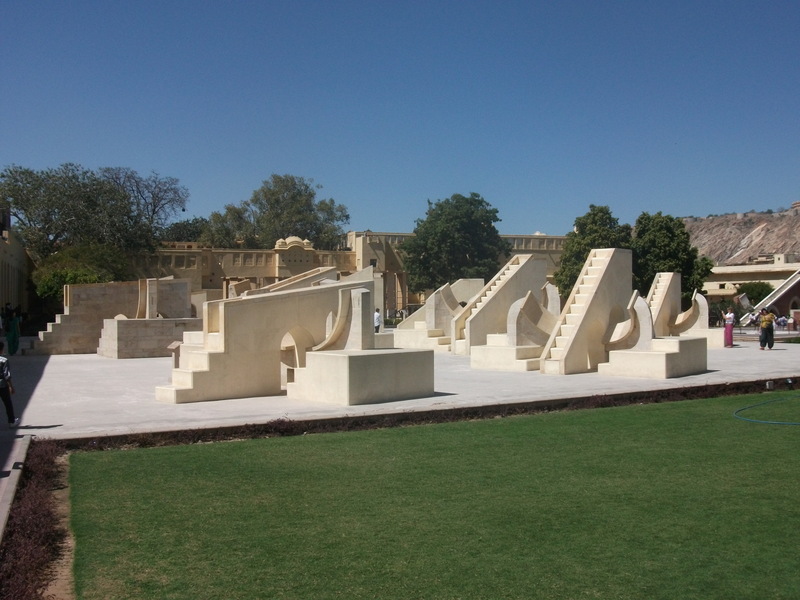 The archeological park, which I had nearly deleted from my itinerary after reading mixed reviews, is a day trip away by bus. It is rather hard to describe this world heritage site, partly because it is huge and covers a bewildering range of remains and partly because I only visited a bit of it as a result of getting a tad lost at one point. Areas I didn’t find until too late in the day are spread over the side of Pavagadh hill with a popular pilgrimage temple on the top, accessible via a cable car. 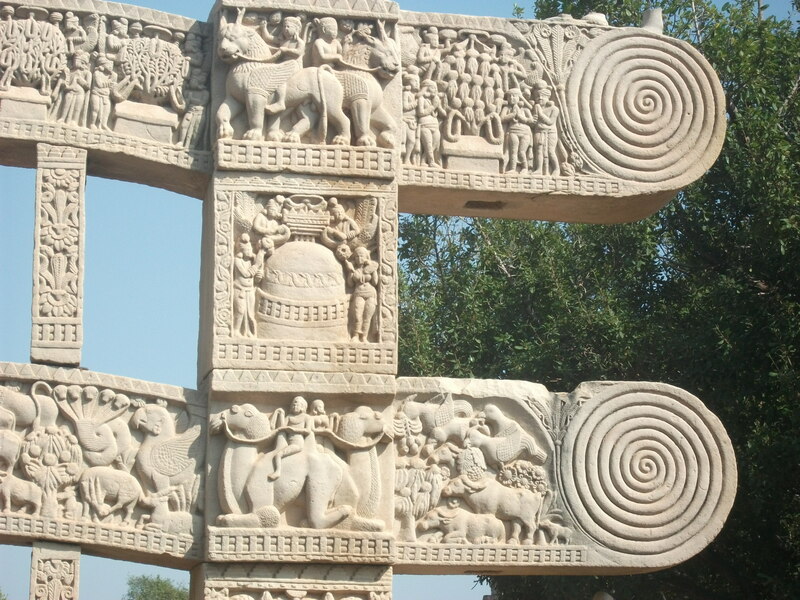 There are a lot of unexcavated archaeological pre-historic remains alongside more recent vestiges of structures from the eighth to sixteenth centuries including Hindu temples and water systems. 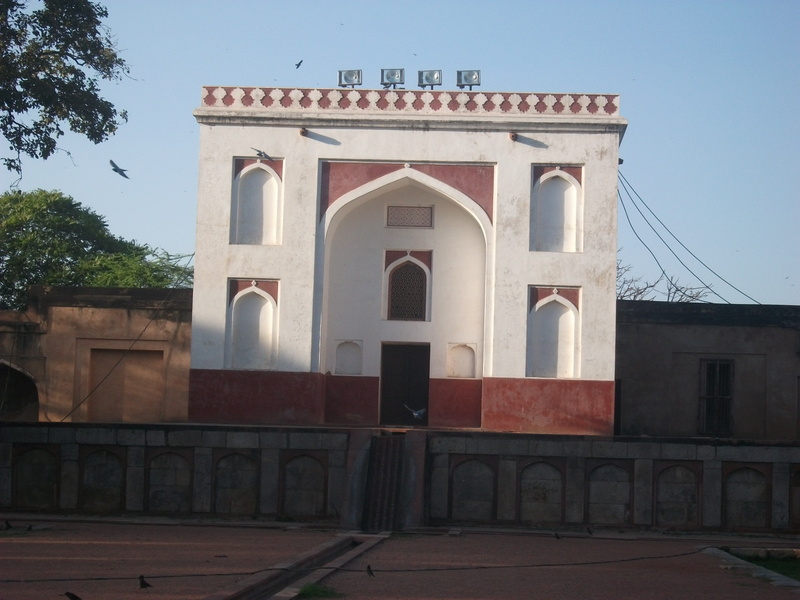 What I saw were a group of mosques dotted amongst the fields at the bottom of the hill, within and around the ancient walled city. 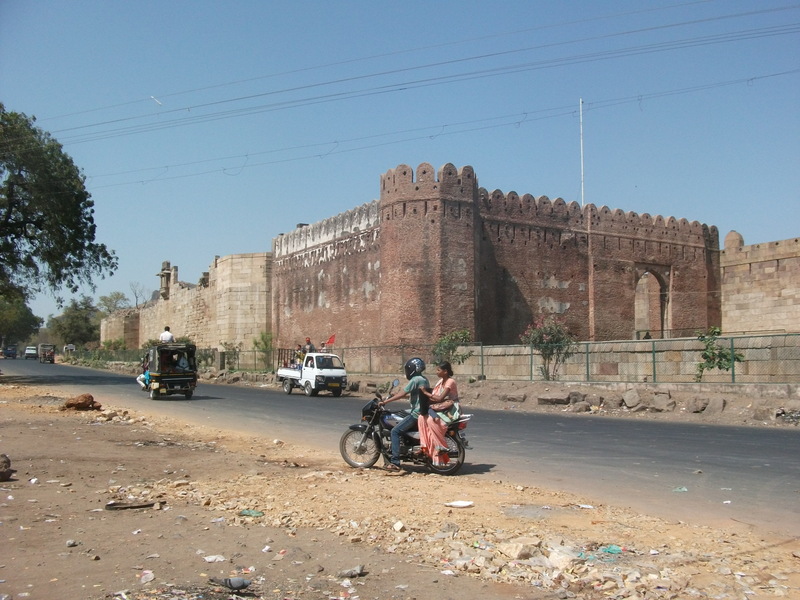 This walled area was originally the royal enclosure of a sixteenth century capital of Gujarat and now contains the modern village of Champaner. 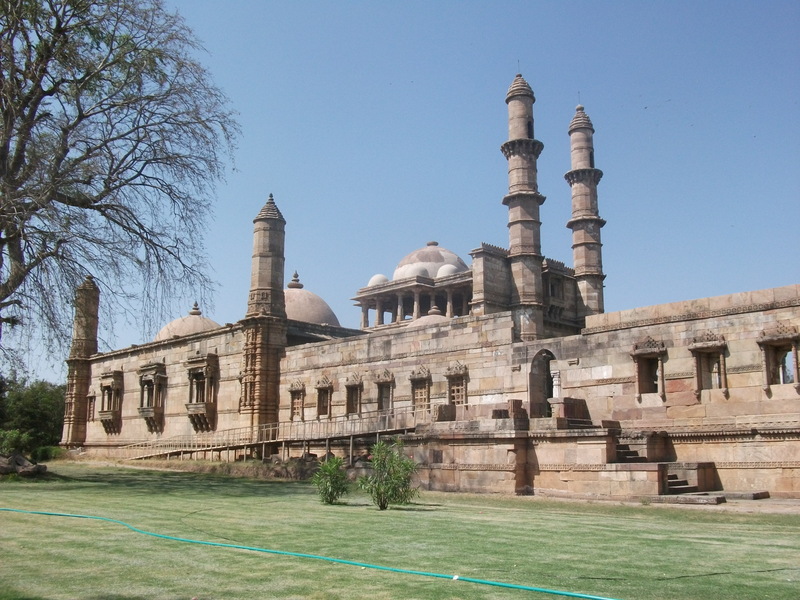 The mosques are attractive, with tall thin minarets, decorative carving and pierced stone windows. 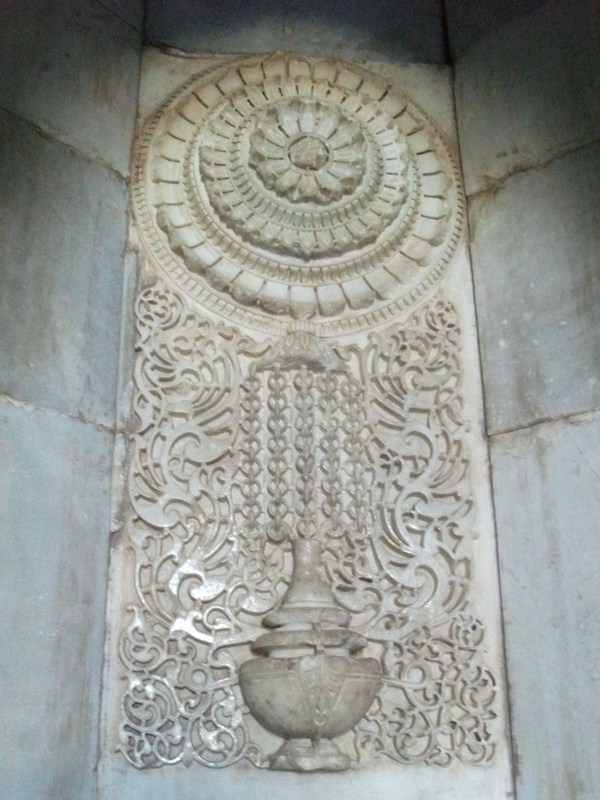 The style is apparently a blend of Hindu and Islamic elements. They also seem virtually unvisited; I doubt many tourists make it to the one at the end of a long path through the woods. 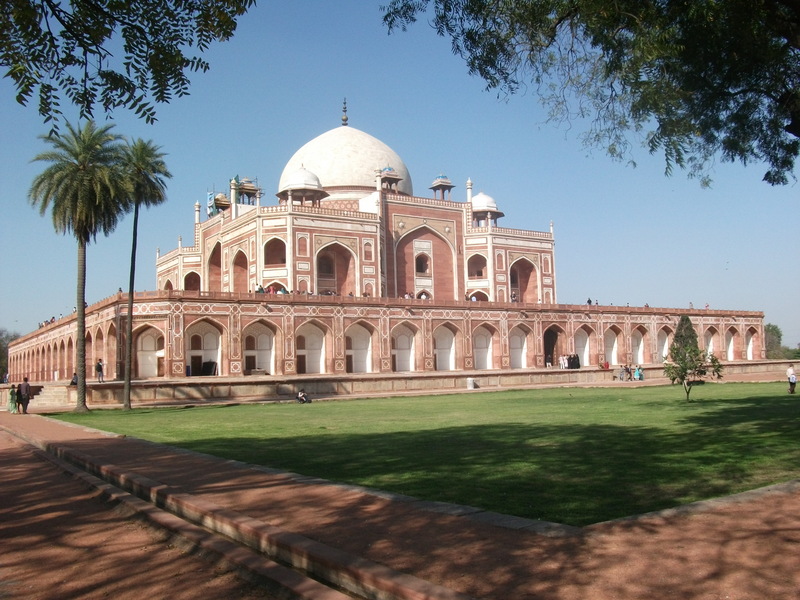 I wasn’t even sure I was going the right way, I just kept going because it was a lovely day and I was having a delightfully peaceful walk, peace and quiet being hard to come by in India. I still can’t tell if I saw the best bit of this world heritage site whilst avoiding some dull piles of masonry, or whether I missed something wonderful. I do rather wish I’d had the time for the cable car though, maybe another time. The centre dome is gold because I only have two of the tan ones with me.